Thanks to everyone for making WCNC'17 a grand success! Some WCNC'17 photos have been posted to our Facebook page. A website with all photos is being created and the link will be posted here once complete. Plenary talk slides have been posted on the plenary program website here. News stories around several of the plenary talks can be found here, here, and here. The Hottest Wireless Startup Prizes were awarded to Blue Danube Systems, Plume WiFi, and Phazr. Phazr's award was showcased by Yahoo Finance here. Enter your photos of WCNC here. The program at a glance is here. The detailed technical program is here. Thank you to the Marconi Society for sponsoring our student poster/demo session and awards, and to the NSF Center for Science of Information for hosting the Student Mentoring Lunch. Best paper award winners announced! Click here to see this year's winners. 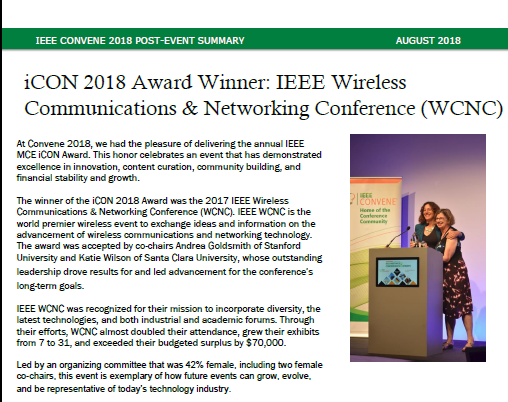 IEEE WCNC is the only IEEE conference focused exclusively on wireless research, technology, and applications. It brings together thought leaders from industry, academia, government agencies and other institutions to exchange information and ideas on advancing the state-of-the-art in wireless communications and networking. Located in the heart of Silicon Valley, the conference aims to serve as a catalyst in bringing together participants from academia and industry to help foster new connections and ideas. The conference will feature a comprehensive technical program with technical tracks on wireless research, technology, applications and services. In addition, the conference program includes workshops, tutorials, and panel discussions on today’s state-of-the-art as well as what the wireless future will look like. An expanded industry program, including a large exhibition hall showcasing the latest wireless technology, will provide opportunities for industry professionals to share and learn about the latest ideas, trends, and product innovations in the wireless industry. The 2017 edition of this conference will be held in San Francisco, CA, USA on March 19 - 22, 2017 at the Hyatt Regency.